Description: Elephant Trunk is normally used with collection hoppers for placing concrete into deep or narrow forms. Flexible and abrasion resistant, it can be attached to a variety of collars to meet job requirements. Elephant Trunk is available in light and inexpensive polyvinyl chloride (PVC) systhetic or a nylon reinforced plastic elephant trunk which is sturdy and flexible, yet strong and ligth. Both types of elephant trunk may be obtained in 6, 8, and 12 inch inside diameter sizes. Heavy duty rubber elephant trunk is available in 8 inch, 12 inch, 16 inch and larger sizes. Steel collars are used to support the elephant truck and connect it to the hopper by chain linkage. Rectangular collars are used when pouring into narrow forms. 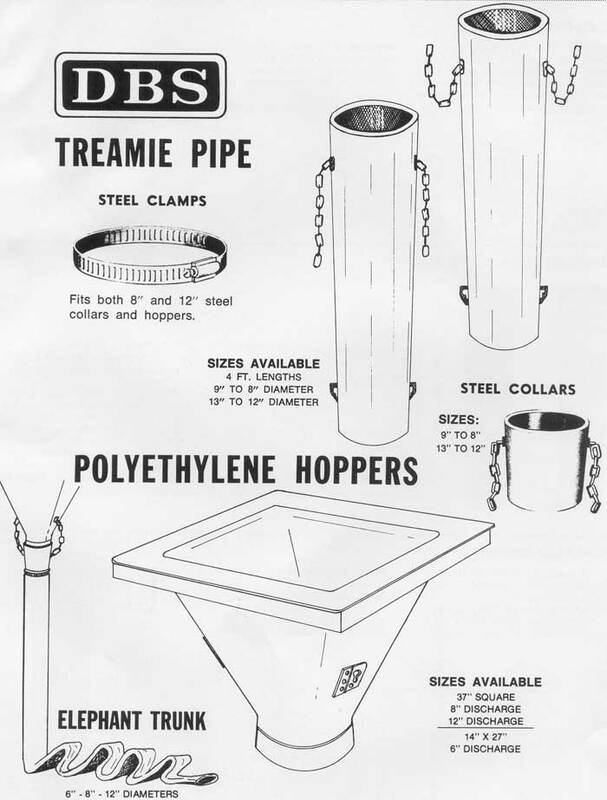 Round steel collars are available in 6, 8, 12 and 16 inch diameter sizes. Rectangular collars are available to fit all sizes of elephant trunk. Description: Drop Chutes are normally used in conjunction with collection happens to restrict free drop of concrete and prevent segregation. They come in short, lightweight sections that hook together to form a flexible assembly and are available in standardized lengths and diameters. As the pour progresses, drop chutes may be removed to allow the placemnt to continue yet maintain free of the the concrete to acceptable limits. Manufacturer: DeCanio Builders Supply Co.